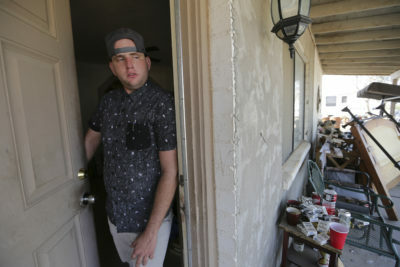 Aaron Robinette, pictured at his home in Casa Grande, Arizona, in May, died of a drug overdose July 26. Aaron Travis Robinette, who was featured in a May 31 investigation about drug diversion programs, died of an apparent heroin overdose last week. He was 25. The investigation published by Reveal from The Center for Investigative Reporting focused on the shortcomings of a for-profit company that runs criminal justice diversion programs for prosecutors. Prosecutors pay nothing – an enticement in times of tight budgets. Offenders cover the costs. But the investigation found the programs are failing some of those who need help the most. The story featured Robinette, who was living with his father on the outskirts of Casa Grande, Arizona. He had been struggling with addiction and spoke bitterly about the local diversion program’s emphasis on payments and lack of assistance to address his substance abuse. His family called him “Bear,” a nickname Robinette earned as a baby because he growled when he was hungry. He played guitar and some drums. He loved riding his dirt bike and had hoped to study to become a nurse. His sister Ashley Robinette, 33, said there’s no way to know whether a more intensive diversion program would have saved her brother. But what he got did nothing for him. The circumstances of Robinette’s death suggest he overdosed, according to family members, but the Pinal County Medical Examiner has not yet made an official determination. Toxicology tests through an outside laboratory are pending. Diversion is popular among criminal justice reformers seeking to reverse decades of tough-on-crime policies that have done little to reduce recidivism. The programs also are becoming increasingly appealing to prosecutors, who are overwhelmed by heavy caseloads of nonviolent offenses. Diversion thins those caseloads by plucking offenders out of the process early on. Ideally, it should steer them to programs meant to address the underlying reasons for their conduct and prevent them from cycling back into the system. An offender who meets all program requirements generally is spared a criminal conviction, which can stand in the way of employment, housing, educational loans and more. For-profit companies have been moving into diversion in recent years. Reveal’s investigation focused on one nationwide company that brands itself as a leader: San Clemente, California-based CorrectiveSolutions. In its proposal to the Pinal County attorney’s office in Arizona, CorrectiveSolutions pledged to forge close ties with treatment providers and nonprofits in the community and seamlessly refer program participants to substance abuse or mental health treatment, vocational training, educational resources, food banks and more. That didn’t happen, our investigation revealed. In December 2015, Robinette had been offered the CorrectiveSolutions program for a nearly two-year-old marijuana possession arrest – before he was charged with a crime. If he paid $715 and completed a class, community service and some counseling, he wouldn’t be charged. Mandatory drug tests would cost extra. The price was out of his range, but he signed on. He said he divulged his heroin problem to his CorrectiveSolutions case manager, who was not a licensed counselor, but a former police officer. But he got no referrals to services or treatment. Counseling was a brief rundown of whether he’d met his obligations. Phone calls from the CorrectiveSolutions call center prodding him to pay were constant. Robinette overdosed, landed in a psychiatric hospital and arranged to go to rehab. He told the CorrectiveSolutions program manager what was happening. But when he stopped by with his paperwork on his way to treatment, he was told he’d been flunked from the program. Robinette was charged with a felony for failing the program and couldn’t get work. He was offered diversion a second time last summer. By then, the program was shorter and cheaper due to low enrollment and high failure rates. That time, Robinette wasn’t required to drug test. “It’s almost like they’re giving me a free pass through the program just to take my money,” he said. He fell into a depression. He relapsed. In December, he finally was released from the program. He got a job, but he was struggling. In addition to sister Ashley, Aaron Robinette is survived by his father and stepmother, Steve and Debbie Robinette; two other sisters, Amber and April Robinette; and a younger brother, Andre Robinette. As it turns out, a new Pinal County attorney, Kent Volkmer, took office early this year. Two months ago, he terminated the contract with CorrectiveSolutions. He’s bringing diversion in-house in an effort to ensure that participants get referred to meaningful services. Volkmer is modeling the program after a neighboring county’s system, which assesses offenders, channels them into tiered programs based on their needs and tracks outcomes. In April, before Reveal’s investigation published, Robinette had texted to say he was doing well. “I will be happy for you to see me sober and healthy,” he wrote. Correction: An earlier version of this article failed to note that toxicology reports on Robinette's cause of death are not yet complete. This story was edited by Jennifer LaFleur and copy edited by Nikki Frick. Lee Romney can be reached at leoraromney@gmail.com. Follow her on Twitter: @leeromney.